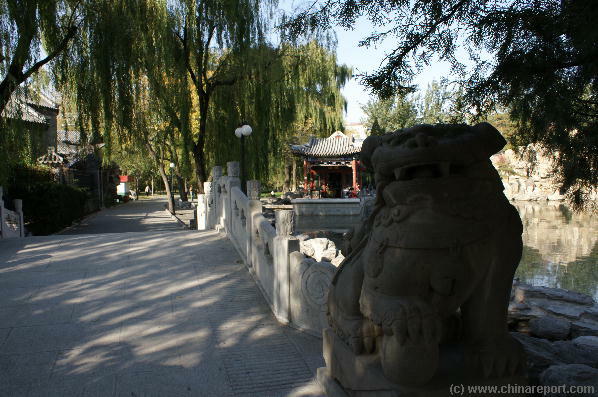 Welcome to The Beijing Report's Digital Introduction to Ritan Park (Ritan GongYuan) and the Altar of the Sun located in the South Embassy District, a central part of the Chaoyang District of East Beijing. The Ritan Park of current day Beijing represents the remnants of the once larger park of the important Heavenly Altar of the Sun, a Daoist Imperial Temple complex which especially during the early feudal rules of the Ming Dynasty (1368 AD - 1644 AD) was a very important place of Imperial Ritual. As one may infer from its name, the rituals in case were related to the worship of the Sun, a part of the program of rituals for the ensuring of abundant harvests and the prevention of food calamities within the Empire. At various other Heavenly Altars, other related Heavenly Powers such as the Moon and also the Earth, were worshipped and communicated with in order to uphold the all important "Heavenly Mandate", basically the license bestowed upon the Emperor by the Heavenly Powers to rule the earth in their name. As no Emperor would like to have his license revoked and his Dynasty ruined, the Altars and their Temples such as the Ritan Temple were institutes of the highest importance. The Heavenly Altars of which Ritan was but one, were however not empty places merely visited by the Emperor once or a few times a year, on the contrary. During the heydays of the Ming Dynasty and during most of the Qing Dynasty Era, they were continuously active places of worship where daily rituals were tended to by an army on Priest and Monks. Cafe' offers its clientele plug-ins for immediate internet access with as may be expected the latest highspeed connections available. Getting away from the office towers proper, anyone may step up or reserve a space in order to have a Beer, Iced Tea, coffee, while letting off some steam and enjoying the garden landscape. Crucially in the fast moving society of the CBD in Chaoyang, clientele are able to surf the internet while actually remaining outside and in view of the garden pond and landscaped gardens. Apart fom the various drinks the little restaurant offers a surprising breakfast, lunches as well as diners. Mind you, there is only a small kitchen so the menu is limited ! Regardless there is a sublime baked salmon pie or beef tenderloin available. Seemingly in a rather obvious location situated near what are now among the most visited landmarks of modern architecture in the city, the Ritan Park should be easy to find even for relative newcomers, however experience learns that the last surrounding blocks can be confusing and so form an obstacle to a swift and easy arrival. Only natives of the area make no mistakes whatsoever. A trip out to the park of course means making ones way out to Chaoyang District first. Usually, this means making use of the very modern subway/metro transportation system of the city. 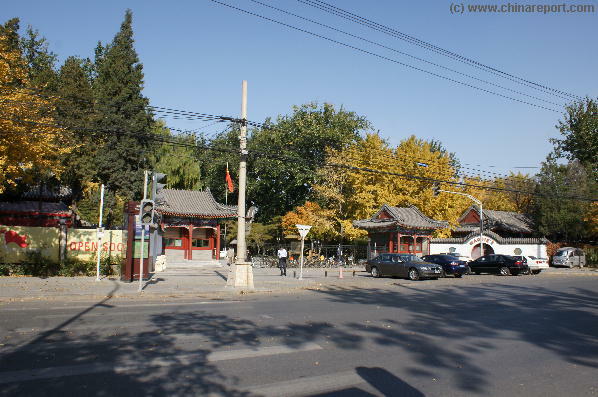 As the park is situated near the south east corner of the old Ming Era city walls, the space of which is also followed by the important circular line of the subway system, one needs to choose ones connections well in order to at least end up at the (former) Jianguomen Gate. 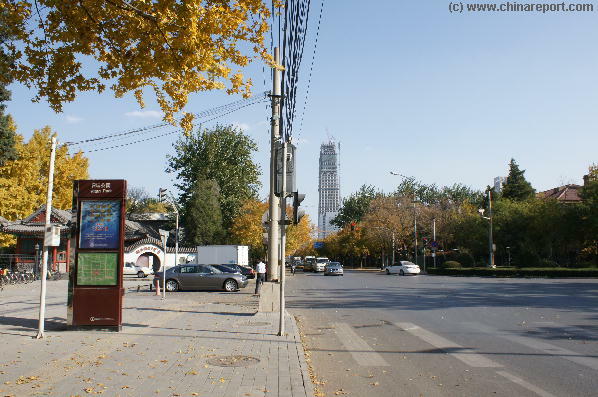 Although one can make ones way to the park from any place in the Chaoyang District, most first time visitors to the city end up traveling through Jianguomen Station as this is nearest the park and also allows for a stroll along one of the main boulevards of one of the most interesting zones within the Chaoyang District. Passing eastward along Jianguomen Outer Street and then upwards into the (usually guarded) gate of the south embassy district one can already enjoy various spectacular views of the new city as well as explore and discover some less conspicuous but nevertheless interesting locations and scenes. About half ways along one possible route up to the south gate of Ritan Park from the main thoroughfare of Jianguomen Outer Street one may find the Embassy of Cuba, which as a vehemently Communist or Socialist Nation of the past has been a long standing official ally of the Peoples Republic of China. According assorted stories of interest exist. Another striking feature which appeared around the year 2007 is the so named "Russian Bar" which sits not too far from the south gate entrance into Ritan Park. Although we have no desire to inform you as to the details of what may be going on there, it is interesting to know that from the get go due to its excellent location it has been frequented by well to do youngsters and hipsters. Correctly listed by "The Beijinger" (Magazine) as one of the oldest (and thus historic!) bars in the entire city of Beijing, a city now 4 times the size it had only 15 years previously, according to the reputed magazine TimeOut Beijing, by now, this bar should even be regarded as one of the nightlife institutions of the city. As one may find, the bar has a valet parking system and others frequently park their exclusive and expensive cars out front just for show. If it ever was, no longer is the south embassy district the restrictive realm of dusty office types, lonely foreign technical experts and rather lifeless diplomatic stooges and their minions. View of the south-west corner of the Altar of the Sun Park, which sits surrounded by tree lined lanes of the south Embassy District, which up to about the year 2010 was a fairly quiet part of the city. With the full development of the Chaoyang Central Business District right adjacent all aspects of life including traffic have changed considerably. The park however continues to provide a welcome getaway from all city life and associated stress. Imperial Dignity could afford such a lavish complex as the Altar of the Sun Temple. As the State was the Church and the Church the State, politics always were involved, even in such seemingly innocent affairs as publicly held rituals. Thus, not only was the worship of the Heaven's an obligatory and thoroughly superstitious ritual, it was also a way for the Emperor to remind the public of his extraordinary wealth and other powers. Altogether, although not the best preserved or most visited of the former Heavenly Altar sites, the Ritan Park forms a unique museum of extraordinary and irreplaceable Temple architecture from a now bygone era. Inside the park visitors can not only see the original altar and its circular walled enclosure, but several associated temple pavilions and a restored Imperial Gate, as well. Remaining as a half forgotten park through the turbulent "Revolutionary Years" and reopened as a Government Protected cultural heritage site in 1951, the Park also represents various aspects of Communist Revolutionary history and legacy as presented- and upheld to the public. As one may find, Ma Jun, a very highly respected early revolutionary hero and martyr, one of the five top student leaders of the May the 4Th (of 1919) Movement, lies buried within the park, his tomb since the year 1951 dressed in white marble and honored at various later occasions by various high up Communist Party Cadres. 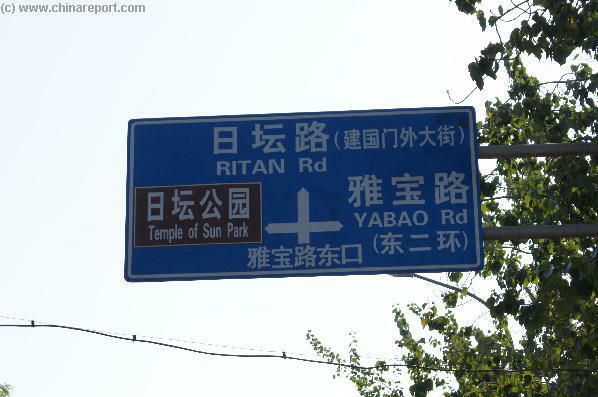 Follow the road signs to make your way to Ritan Park either from the south Embassy District or the adjacent maze and towers of the Chaoyang CBD. 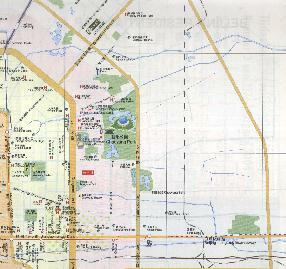 Overview Map of Ritan Gongyuan i.e. Altar of the Sun Park, as available at all park gates and various other locations within. The location of the Sun Altar is easily identifyable as it is surrounded by a large circular wall creating a white circle on the map. As one can tell the current park contains many other structures. While in the surrounding streets and blocks the new (east) Beijing of Russian Markets, and later Malls, Office Towers, Hotels and Conference Centers arose,the Ritan Park became the prime address of true leisure, the only place nearny allowing for a kind of throwback to the Imperial styled leisure and slow appreciating pace of the city and the people of Beijing. As one may find upon frequenting, helped by the relative scrutiny and seclusion of the surrounding south embassy district and the assorted Embassies, the Ritan Park is one great garden where ruffians and less sociable types are effectively shunned, much to the delight of visiting parents, playing children, curious tourist and also many of those working in the nearby offices. The rising of the China World Trade Center No.1 Tower in view of the south gate of Ritan Park. WTC No. 1 by now is the tallest and also most eye-catching of all towers and office blocks in the impressive Chaoyang CBD, or Central Business District. From the tower one has great view of the park which is why the tower was also known as Parkview Tower. A recent addition of the Parkview Building elsewhere near the park has sort of eliminated the nickname for the World Trade Center tower. gates, no alcoholic beverages were sold within the park. That is, until recent years. After the opening of a "Russian Bar" (also Maggie's Bar) along the south edge of the park but factually exterior of it as a pre-Olympic opening shot, of late Ritan Park has in fact become the somewhat unlikely home of one of the more popular and "groovier" Bars in modern Beijing. That is, by means of occupying a traditional element of the Garden, the lauded Cozy Stone Boat Cafe' located along the coastline of the largest lake inside the Park, the Boat Bar seemlessly blends into the landscape while offering a variety of stiff drinks for those in need or crave. Naturally, this does not mean anyone is welcome for a binge drinking session, which is not the air of the place at all. 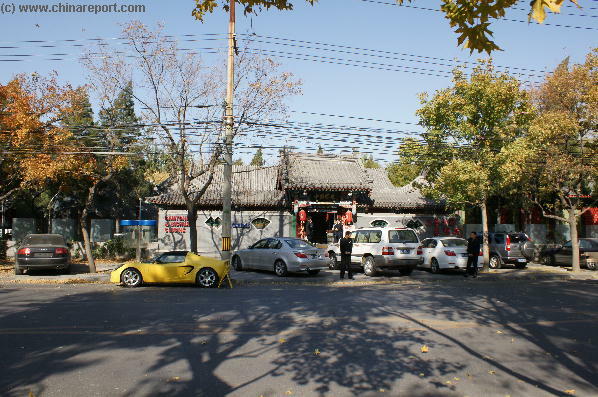 A luxury sports car sits parked outside of the Russian Bar, a noteable establishment which caters to those enjoying a cool lifestyle in the financial and trading district of Beijing. Valet Parking boys stand at the ready, even on layed back November mid days (Photo: November 2007). Russian Market and Mall building in one of the many evergreen tree lined lanes surrounding Ritan Park. Another somewhat hidden place to explore, then lose ones way in or near (Photo: November 2007). The southern gate of Ritan Park as photographed in November 2007. 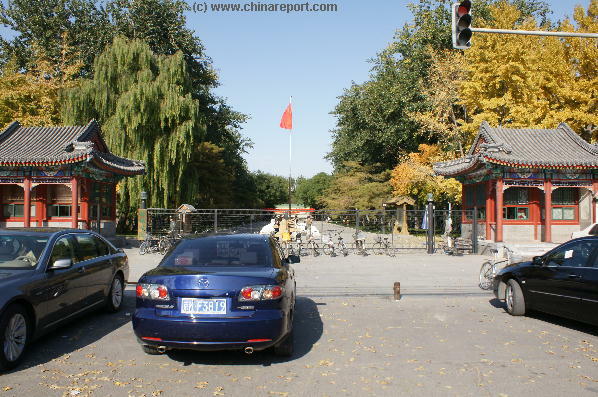 As one can tell, the entrance gate is nothing alike the gates of other altar sites most noteably the the Temple of Heaven Complex now Tiantan Park (Tiantan Gongyuan). Having been mostly ruined in the age of turmoil, war and revolution in China and enlarged as a park in the 1980s, the remains of the ceremonial gates are all found inside the park. A surprising and in fact rising number of sites of interest may be found in the streets and blocks immediately surrounding Ritan Park. As mentions, there are various Embassies one may pay a visit too although on the location there usually is not too much too see. The prime Embassies of interest are the one of Cuba, which usually displays votes and news events on the Leadership, although less actively so in recent years and the other the North Korean Embassy, which by virtue of its home Nation alone raises a mistique that draws many a tourist and foreign passer by down to have a look at the high gates and white buildings of the extensive complex. Much larger than the Cuban Embassy the DPRK Embassy stands relatively away from any roads, has a very secure and well guarded gate which however also does display interesting proganda imagery and other newsworthy information on the DPRK. hat is, according to their Diplomatic Machine stationed there. The DPRK Embassy also serves as one of the main visa awarding stations, and so gatways to travel into the DPRK, which is why, very unusually, one may see foreigners enter the gates. A couple leave the south gate of the park after having a stroll with their baby. As one will find, a lot of times the Ritan Park is mostly a family and childrens place not a tourist venue. Other, less historic or politically flavored sites to visit are there in abundance. As mentioned due east by south-east of Ritan Park one may find the Mall of the Silk Alley, a true tourist magnet and must see shopping trap. Due north and east of there modern architecture buffs can start their having their thrills at Guanghua Lu Soho and work their way up to the exclusive luxury Mall aptly named The Place. Although one need not necessarily have shopped there, one does need to have been there and seen among things their giant LED screen and presentation. 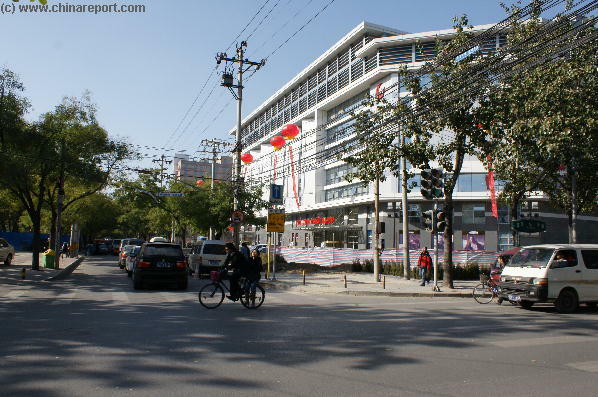 Interspersed in between are various small bar zones, restaurant rows and various malls. Study the map for other places to visit as there is much more to see and experience. Buy a ticket and make your way into the park, which altogether occupies exactly 20.62 hectares. Just beyond the gate is a miniature PRC Flag stand and beyond it the Sun Mural, which essentially represents a scene of (ancient) prayers to the Sun, or in a more literal translation the God of Bright. Since the year 1530 AD, when under the Jiajing Emperor of the Ming Dynasty (Reign 1522 AD - 1566 AD) a few re-arrangements of the prayer rituals and existing altars was put into effect, the Sun was worshipped at this location, the assigned Priests inside performing daily rituals at this and other altars, in order to ensure to continuation of the Mandate of Heaven as it had befallen the Dynasty and Emperor of their day and time. As one will find, among all the various heavenly altars in the city, the Sun Altar was the only west facing altar. All other altars including the Great Altars at the Temple of Heaven (now Tiantan Gongyuan) are alligned in the traditional south to north direction. 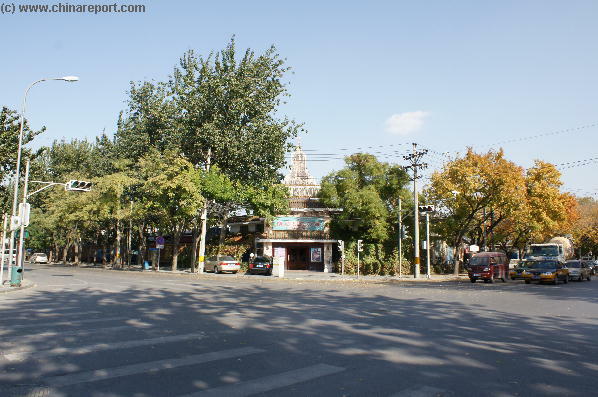 Also, those chosing to walk to the park from the location of the Silk Alley (Xiushui Street) Mall and the nearby Yong'An Li Station after a fun shopping spree often travel via Jianguomen and Station first. 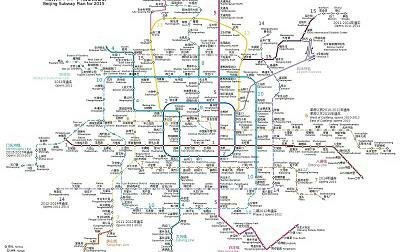 Please make use of the adjacent Map of the Beijing Subway system in the year 2015 to find the appropriate stations to travel from your hotel or address to Chaoyang District and the Ritan Park. 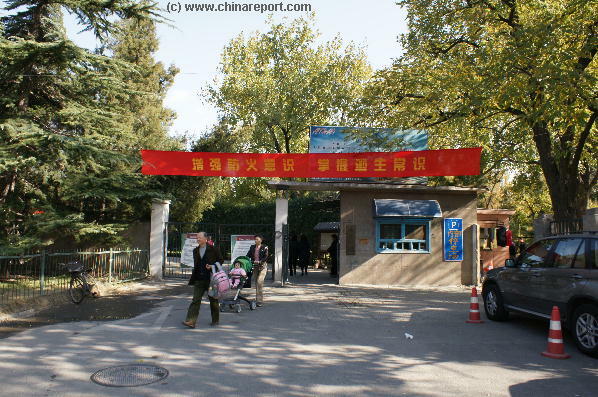 As one may find, the Jianguomen Station and the Yong'An Li Station are phsycially nearest Ritan Park. As an alternative one may walk down from the Chaoyangmen Gate, perhaps after visiting the spectacular Dongyue Miao Daoist High Temple. This route also provides for an interesting walk, however the distance from Chaoyangmen to the north gate of Ritan Park is several kilometers. When heading down, there is little need for preparations. Near the subway stations one can always get drinks or snacks or food. Bring small money and change for the subway and prevent getting stuck at the ticket machine or office. As long as the economy churns all certainly is a bit more lively in the neighborhood. Instead of the relative boredom of the past, the last vestiges of Confucian and Communist morality seem to have left through the backdoor, as apart from being a bar and dancing, the address is also known as "pick up bar", in other words a place where lonesome men with sufficient cashflow can go to meet up with and be entertained by "hostesses" or actually often prostitutes associated with the bar organization. Needless to mention, this is the real reason why this establishment keeps being mentioned as the "Russian Bar", rather than by its current official name as "Maggie's Bar". It seems as though the Russians have once again carved themselves a portion of the prostitution market in north and east China, much alike their poverty stricken and exiled white Russian predecessors in the city did now just over a century ago. In their time, "White Russians", or rather their wives and girlfriends, were to known to be the experts in the field. Before that of course there were the sing-song girls, flower houses and the like. Various reviews and presentations on the internet mention the availability of not only Chinese, but also Mongolian and Malaysian women, a clear hint of possible ties to a crime syndicate, although one can never be sure as a total outsider. Maybe it is just that everyone is going for gold in the new China of today. In short, although it is probably fine to marvel at the cars outside, better stay clear of this not so cozy bar, unless one has clear reasons to go there. Like the original American Hot Dogs, which is another thing that Maggie's is famous for. No review seems to ge complete without it. We are not sure if this term is code for a special order, but one may step inside and find out. Although prostitution was virtually stamped out in the Communist heydays and the "business" remains illegal across the Peoples Republic of China, this does not mean the industry does not exist. On the contrary. As one will find, it is but one of many such addresses found across town and city. 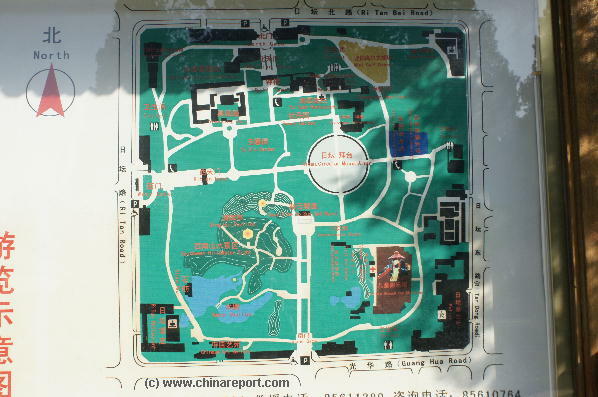 Eventually, making use of your map, mobile device and simply the signboards along the road, find your way to the south gate or any of the four gates of the park. Inside, the park is filled with a variety of elements, old imperial ruins and pavilions, hills and ponds, but also a climbing wall and fitness zone and other sites of interest, all of which are further reviewed in the subsequent pages of this article. Cars parked at the south gate of Ritan Park. Just beyond the south gate is a maniature white marble flag stand of the Peoples Republic, the flag of which gets hoisted each morning at sun up in coordination with the other Flags raised at Zhongnanhai and at Tiananmen Square. Just beyond the flag stands the sun mural memorial. would arrive outside the western Gate long before dawn. And, only after various forms of ritual clensing, the Emperor followed by his courtiers would proceed and travel in a sedan chair eastwards along the main axis of the Temple in order to meet up with the rising sun. As one may easily comprehend, the most important rituals of the Sun Altar would be performed at dawn, as the first rays of the new sun were striking the altar. More of the history of the Park, as well as the details to the various noteworthy sites within are given on the pages following. Already enlarged in the 1970's under the care of then Premier Zhou Enlai, since the 1980's and the "opening up policies" (Also read about the opening up of China in: "(History of) Silk Alley" and "History of Panjiayuan Market") introduced under the fresh Leadership of Deng Xiaoping, the Park is also surrounded by and so the center of the so called "South Embassy District" and during this period the park was enlarged and filled with further Chinese garden landscapes creating more or less the park as it exists today. In addition to the historical and political relics, a southern style garden landscape with rockeries was created and since, a climbing wall and fitness zone for the use of the general public have been added. By now, many centuries after its heydays, the Ritan Park is not so much a overvisited historic tourist location but rather a convenient large park in the central Chaoyang District just outside of the old city wall where, among things, those who found their fortune, road in life and carreers at the nearby CBD can go to find some leisure and much needed breathing space. As the main green within several kilometers of concrete jungle it offers a welcome repreive. For those visiting and out exploring the most interesting and lively parts of the Chaoyang District and CBD it can also be a great stop off point along the many routes one might choose while navigating the glitter and glamour, the giant office towers, mall levels, wide boulevards and tree lined streets. The later addition of garden ponds and rocky and hilly landscape have turned the Ritan Park from an Imperial Temple into something more alike a miniature Imperial Pleasure garden. With political over-correctness out the door for a while, the element of a Marble Boat resembling the one of the Empress-Dowager the Yiheyuan Summer Palace was added much to the pleasure of many visitors. Inside the boat one will find a small bar annex restaurant. With the nothing less than spectacular rise of what amounts to the new financial district of the busstling new age Capital of Beijing in the adjacent blocks to the east, and an astounding international rise of the Peoples Republic of China, many things if not life itself have changed overnight in Chaoyang and in- and around the Ritan Park. First a forgotten but appreciated park in the assigned district for Foreign expatriates, then within the space of a few years turned into the playground park of the rich albeit not always famous; working, living and shopping in the blocks around, the ancient Park itself has made the jump into the 21st century with conviction.